Purchase 3 months and receive a bonus box! Purchase 6 months and receive 2 bonus boxes! Purchase 12 months and receive 3 bonus boxes! Offer expires 30.04.2019 or while stocks last. Free Box applies to 3, 6 or 12 month subscriptions only. Available to AUS residents only. Gift is sent to the recipient. Contains: Creativkits' April kit is also Easter Special and contains up to four Creative activities each for 5+ and 8+ age groups. For younger kids - Learn About Magnets, Make Your Own Tooth-fairy Keepsake Box, Make Your Own Snow & Paint Easter Bunny Egg Cup. For Older Kids - Build Your Own Dragon Robot, Make Your Own Light Up Bottle, Make Your Own Snow, Make Your Own Melty Beads Easter Eggs. Order yours today! Got children between 5-15? CreativKits subscription boxes provide perfect opportunity to prepare your children for life in a fun and engaging way. These professionally curated boxes are also a perfect gift for your nieces, nephews or other kids amongst your family and friends. The best part is that they are locally assembled and delivered free to your doorsteps along with written and rich media instructions. - We offer activities for girls & boys in two age groups 5+ and 8 + yrs. - We offer activities in all interest areas beyond Science, Technology, Maths etc. - We offer kits based on number of activities i.e 2 or 4 activities that you can choose based on your child’s commitments. - We offer a secure platform for children to share their work and ideas thus enabling Learning by Sharing. Apart from quality activity material, CreativKits contain printed and online instructions, featured story of the month and a bonus children's activity. So, what are you waiting for? 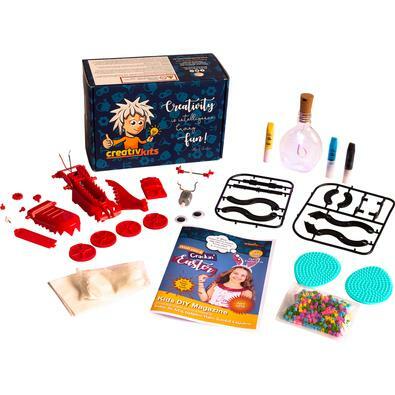 Order your CreativKits subscription box today - don’t let your child miss out! Note: We follow a monthly shipping cycle. Cut-off to order monthly kits is 15th of every month, which are shipped out by 20th of that month. However, a starter kit box can be delivered in 1-2 week timeframe. Great gift idea! I bought a 3 months subscription for my grandson who turned 7 last month. He absolutely loves it and get on to making fun activities as soon as it arrives. My daughter loves receiving her monthly creativkit box and enjoys the learning while having fun. These boxes also make brilliant creative birthday gifts! Please allow up to 1-2 weeks for your first delivery.